I have broad interests in plant population and community ecology, including more than 40 years of research in Africa. For the last 25 years, I have been involved with more applied research at the community and landscape scales in California and Kenya. My current research projects are related to the ecology, management, restoration, and conservation of human-dominated landscapes. My early research (1970s and ’80s) concentrated on basic and theoretical questions in population ecology, and the Ecology of Mount Kenya. I also have collaborated with Lynne Isbell in her studies of primate behavioral ecology. I provide a life history and plant ecological perspective to her explorations of how food and predation influence the evolution of mammalian behavior. (Behavioral Ecology publications). 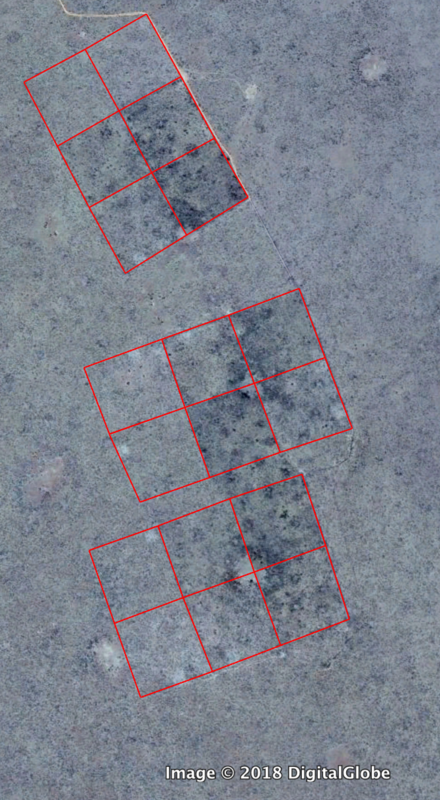 Satellite view of the KLEE exclosure plots in Laikipia, Kenya, where we have been excluding various combinations of cattle, wildlife, and mega-herbivores (elephants and giraffes) from a savanna grassland since 1995. Each of the 18 plots is 200m x 200m. This is an image taken 2015 (Google Earth). Darker areas are indicative of greater densities or forbs and woody species. The larger white areas are anthropogenic glades, and the smaller (30m x 30m) white squares visible in some plots are the 2013 controlled burns.